This has to be one of our favourite places on the planet. The Bay of Fundy, Alma and Fundy Park especially and this wonderful home most specifically. We spent five delightful days with our friends and then after moving on to our pre-booked stays in PEI and Fredericton we headed straight back to Alma for more! I had my fingers crossed that the kids would all be pleased to see each other again and they were. Thus followed another four days of easy going and calm fun. What we loved most about staying here was that the children (aged 4,5,6,7 and 9) got on so well the majority of the time that we rarely needed to get involved. Making for some relaxed time for us grown-ups, whether in the garden, in the kitchen, on the poolside or on the beach. The kids played together and explored in relative peace and harmony, minus the odd small disagreement, or one feeling left out, but this often sorted itself out when they just switched the dynamics around; a three and a pair, or one or other goes off to do something else and you have two pairs or a happier group of four. It was so liberating to be able to sit back with like-minded folks and 'let them be' or 'leave them alone' (a long standing motto of ours!) And as we all unwound and the cobwebs were blown away we all breathed freely again after what seemed like one crazy year. We went to quite a few of the National Park programmes (more on that separately) but here we are at a campfire on the beach. These three little friends of ours are just so special. It's partly in the genes of course, but not a little is to do with how awesome their parents are and how open their play is. No toys or telly works wonders! We are doing alright but this time served as another reminder to stay on top of it and not slip. Or slip any further I should say :) Another toy clear out on the way! What do kids really need in order to have fun playing anyway? Not things, just imagination, curiosity, nature, their ability to live in the moment and, when given the chance, to totally lose themselves in their play without worrying about anything. A world of possibilities. This is what it's all about just now. 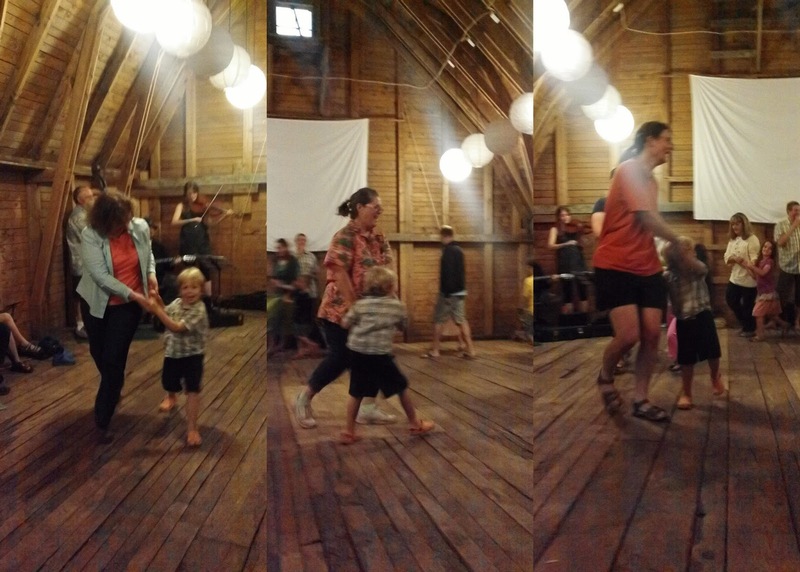 We were also invited as tag-along-friends-of-friends to a pot luck barn dance. The rural coastal area is stunning, the barn was twinkling with fairy lights, there were lots of interesting people to talk to, chickens to run around after, music to dance to and great food (including lobster). There was also a lovely little farm road up a hill, through field and forest, which was perfect for a stroll when Araliya needed a little quiet time, which fortuitously coincided with sunset. There were dances for the kids as well as an adults only Strip the Willow (a little more tame than at a Scottish ceilidh but still good fun). Two of our friends were in the band (Matt and 9 year old Ira on fiddle) and Lindsey called one of the dances. Tadhg and Siobhan especially loved the dancing, Brendan loved spending time with the chickens (we miss ours!) and Steve was most chatty with the locals. A good time was had by all. Also a favourite of mine was lots of time spent on Alma beach where the kids played allowing us lots of peaceful time sitting and chatting. Brendan in particular LOVED this area of big boulders (below). It's a sort of wall protecting the estuary harbour from the advancing beach, and the piling up has left big tunnels and holes everywhere for endless hours of play and exploration. I was excited for them as it reminded me of a favourite play place in Saudi, where I scrambled around with my Australian neighbour friend, William. Until a close encounter (a little too close for comfort!) with a venomous snake enouraged us to take a long break. We also had a fair few chances to get out for child free activities. Steve enjoyed kayaking twice, downhill mountain biking, a few geocache hikes, a hike to a waterfall, and he joined Lindsey and the Tuesday night swim and spaghetti group for a 1100m swim in Bennett Lake. Siobhan went on an edible forest walk with the Park, a lovely walk at Two Rivers with Lindsey and fossil hunting with Ira along the cliffs. Lindsey took me out for a walk one evening, not giving me any description of where we were going, so I assumed it was just a walk in the woods. We ambled along a trail and suddenly this gorgeous vista opened up and my jaw dropped! This photo does not do it justice at all. The tide was out and this wee river meandered across the marsh. It was sunset so the light was lovely (though I didn't have a camera). A day or two later I took my crew along one morning when the others were out for swimming lessons. After some initial grumbling and bickering because the bugs were bad and Tadhg was "tired" (read: annoying and whiny, and the bickering voices were parental) we walked along towards that outcrop, called Tom's island and cut off at high tide. When we reached a breezy spot the bugs disappeared and we spent a lovely couple of hours exploring the area. Brendan jumped about on the rocks and listened to me prattle on about the geology and fossils while Steve and Tadhg plodded through the mud and climbed to the top of the island. A magical morning. More on the geology in a separate post. Look closely above and spot Steve and Tadhg. That dark line in the mist above is the opposite shore of the bay. Once again, the best bit of being in Alma was freedom for the kids. The pleasure of NOT being contained within a wee house in the city, or even a fenced in yard. They played inside and out, looking for fossils on a nearby trail, checking out the forts in the field out the back, clambering around lobster traps. Brendan was so proud of himself when he biked with Ira to the main street to buy milk one day, and in this photo below you can just about make out Brendan and Hannah going for a walk to the beach by themselves. It's hard for him but I think he gets why this can't happen in the city. Araliya, of course, accompanied us all the time, often asleep, but usually being held and hugged and admired. The life of a happy baby! This draft has been sitting here for a few days. I'm reluctant to publish it, perhaps because once it's posted it will be like finally accepting that summer is over. Oh well, bring on the fall and the cooler weather and routines and street play time and apples and admin and whatever else happens at this time of year. Planning the next trip too of course! Very poetic title for the Blog entry!